Julie Parisien, 19, races to victory in a World Cup giant slalom at Waterville Valley, New Hampshire - her career first victory. Editor’s note: This weekend the Audi FIS World Cup returns to New England for the first time in more than 25 years with races at Killington, Vermont. A quarter century ago, a 19-year-old Maine native made history winning the World Cup Finals giant slalom at Waterville Valley, New Hampshire. This week’s “Behind the Gold” explores Julie Parisien’s story. The young ski racer stood outside the start house at the top of the mountain, a mix of Stevie Wonder, Zeppelin and Beatles playing in her ears. The U.S. Ski Team’s 19-year-old rising star out of Vermont’s Burke Mountain Academy was contemplating her first run lead in a World Cup giant slalom — a position she had never experienced before. She grabbed her poles and twisted her torso to stretch, eyes looking down toward the finish. Below was a sea of spectators — friends, family — mom, dad, her brother. Scared? No, not at all. Confident? Yes — this was her day to win. Easy to guess — Mikaela Shiffrin? No, but remarkable similarity. It was Julie Parisien (now Julie Nuce). On the eve of the Audi FIS Ski World Cup in Killington, Vermont, the 45-year-old mother of four reminisced on that remarkable day in March of 1991 — the last time the White Circus visited New England — the day when she would be the first American World Cup winner in four seasons. 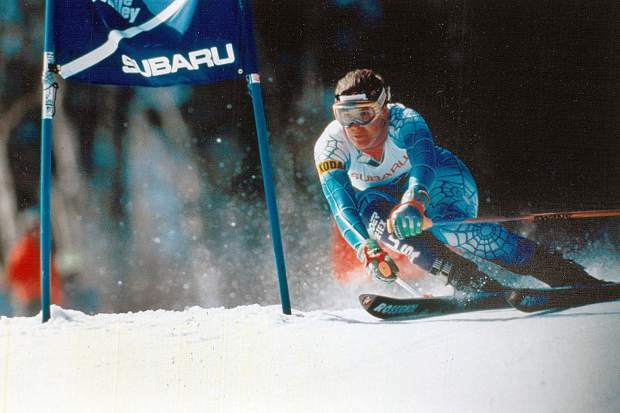 Coming out of Maine’s Lost Valley and then Sugarloaf resort, Parisien honed her skills at Burke winning a Junior Worlds super G medal in 1989. Her storybook tale came in March of 1991. Flying under the radar, she came into a NorAm at tiny Ski Sunlight in Glenwood Springs and beat a World Cup caliber GS field by nearly two seconds — much to the disbelief of the Europeans. Just 24 hours later in a World Cup at Vail, she proved it was no fluke, skiing to a career best fifth. Five days later, it was on to the Finals at Waterville Valley. Leading the first run, Parisien was untouchable, beating Austrian superstar Uli Maier by .84 seconds. Shiffrin wasn’t born until four years after Parisien’s historic win. The two have never met. But the fellow Burkite’s quick rise to success has not been lost on the Maine native. When then 19-year-old Shiffrin led after the first run of the Olympic slalom in Sochi, Parisien reflected on her own Olympic moment at Meribel, France in 1992. Just 20, she led the first run of slalom but wound up out of the medals in fourth. She went on to win three World Cups, a World Championship medal and a spot in the U.S. Ski and Snowboard Hall of Fame. But she also battled emotions after her brother and mentor JP was killed by a drunk driver the next year. She retired after the 1998 Olympics. Today, she finds her joy from raising three boys and a girl and being a hockey mom. She takes pride in her U.S. Ski Team career and the impact she had on her sport. And she looks back fondly on that March New England day when she found the inspiration and focus that every great athlete seeks. One of the most experienced communications professionals in skiing, Tom Kelly is a veteran of eight Olympics and serves as vice president of communications for the Park City-based U.S. Ski and Snowboard Association. This column first appeared in the Park Record in Park City, Utah.